Pollination is vital for a strong ecosystem. Pollination has evolved over millions of years and benefits both flowering plants and pollinators. One three bites of food you eat depends on pollinators. Pollination by honey bees and other species adds $24 billion in value to the agricultural crops in the United States each year. Do you know which foods depend on pollination? Apples, Almonds, Oranges, Avocados, Peaches, Pears, Plums, Cherries, Alfalfa, Blueberries, Vanilla, Cranberries, Tomatoes, Kiwis, Figs, Coffee, Strawberries, Blackberries, Raspberries, Lemons, Limes, Eggplants, Kumquats, Nectarines, Grapes, Cacoa, and more. Location. 38° 53.444′ N, 77° 1.453′ W. Marker is in The National Mall, District of Columbia, in Washington. Marker can be reached from Madison Drive Northwest west of 7th Street Northwest, on the right when traveling west. Touch for map. Marker is at or near this postal address: 1025 Madison Drive Northwest, Washington DC 20004, United States of America. Touch for directions. 8 other markers are within walking distance of this marker. What is this? (here, next to this marker); When does pollination happen? 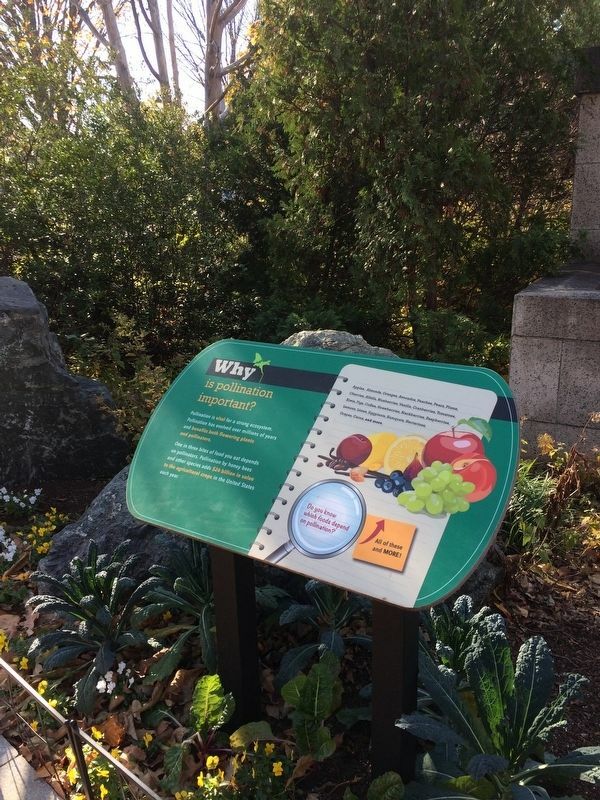 (a few steps from this marker); Where do pollinators live? 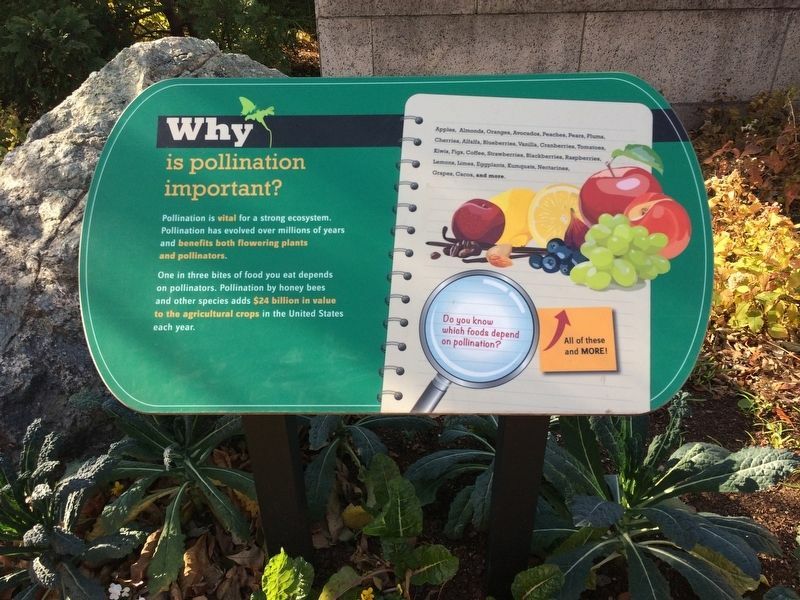 (a few steps from this marker); How can you help pollinators? (within shouting distance of this marker); Triceratops horridus (within shouting distance of this marker); Pollinator Profile: Hummingbirds (within shouting distance of this marker); Petrified Wood (about 400 feet away, measured in a direct line); The American Elm that Grew Along with America (about 500 feet away). Touch for a list and map of all markers in The National Mall. More. Search the internet for Why is pollination important?. Credits. This page was last revised on March 24, 2019. This page originally submitted on November 20, 2017, by Devry Becker Jones of Washington, District of Columbia. This page has been viewed 65 times since then and 7 times this year. Last updated on February 11, 2018, by Devry Becker Jones of Washington, District of Columbia. Photos: 1, 2. submitted on November 20, 2017, by Devry Becker Jones of Washington, District of Columbia. • Bill Pfingsten was the editor who published this page.